Product prices and availability are accurate as of 2019-04-15 06:31:31 BST and are subject to change. Any price and availability information displayed on http://www.amazon.co.uk/ at the time of purchase will apply to the purchase of this product. Alcohol is not for sale to people under the age of 18. For the facts about alcohol visit drinkaware.co.uk. A signature may be required on delivery. By placing an order for one of these items you are declaring that you are 18 years of age or over. These items must be used responsibly and appropriately. Rich, complex and incredibly well-balanced, full of dark fruits, sweet vanilla and signature smokiness. 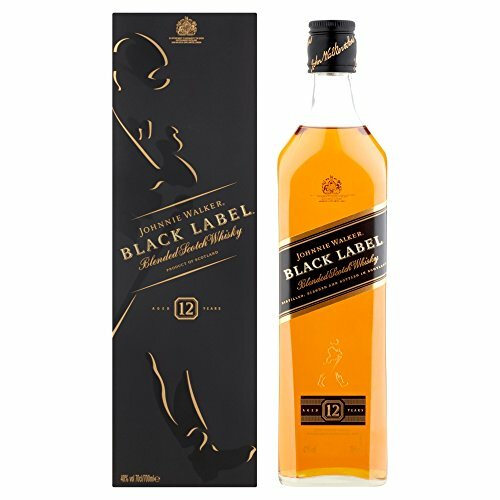 This iconic, deluxe blend offers a snapshot of all the flavours of Scotch Whisky in a glass and is the undisputed masterpiece of the Scotch Whisky world Each bottle of Johnnie Walker Black Label is two decades in the planning, draws whisky from the finest distilleries across Scotland and is aged in the finest whisky casks It can be enjoyed on its own, with a dash of still or sparkling water, or with soda or ginger ale as a long drink Enjoy Johnnie Walker Black Label on its own, on the rocks, with a dash of still or sparkling water, with ginger ale as a long drink.